Spellbound by the visual artistry and giggling in delight audiences marvel at this family-friendly show orchestrated by Magical Balloon-dude Dale. Colorful 3-foot balloons twirl about captivating audiences and transforms participants into stars. With every twist of the wrist, a swirl of a balloon and funny pun uttered captivates the audience like a Pied Piper playing a tune. Swept away by the balloon twisting choreography, are parents relaxing and enjoying the family moment. Tranquility sets in; knowing that behind every twist and joke is a veteran entertainer ensuring that the unexpected pop will not deflate the fun. 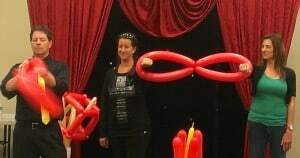 Be it a show or roaming entertainment, your guests will see things they never dreamed possible with balloons. Blacklight works in most environments. It only requires the lowering of lights, but the darker you can make it, the more dramatic the effect for the audience. The Art of Inflation interjects fun into an event, and its flexibility allows park district directors to use this show for special events that require a great family-friendly show that gets an audience laughing. Twisted silliness and creativity are not just left to the kids- parents are involved too!